Do you know others in our district who would like to receive my e-news updates? Please feel free to forward this e-mail invitation to them or click on the share button below. You can also read previous editions of my e-newsletter by visiting my websiteand clicking the NEWS tab. The fall is a busy time for legislators as we prepare for the coming legislative session. I have been in Olympia for the past few days for meetings of interim committees of which I am a member. During this time, I was elected to the executive board of the Joint Veterans’ and Military Affairs Committee. As a Navy wife and mother, I have firsthand experience of the challenges that these members of our community face. Over the past few years, I have sponsored legislation for our state’s veterans and their families has increased access to an affordable college education, increased support for county veteran funds and ensuring that benefits owed to our veterans are protected. I am also a member of the Select Committee on Pension Policy. This group of diverse stakeholders is responsible for making policy recommendations to keep our public pensions strong. For years, our pensions faced similar struggles to those around the country with significant liabilities and budget decisions that made the problems worse. I have advocated strongly for prudent investments to keep our promises to hard working state employees, firefighters and police officers. Some states are struggling with significant underfunding of their pensions. Our state has been a good steward of these funds and enacted legislation to bring all our pension systems to fully funded status by 2024. Our per capita liability is low and our pensions are nearly 90 percent funded. As you may recall, the Legislature adjourned without a Capital Budget or a needed fix for the 2016 Hirst decision, which limits rural economic development by requiring costly studies before a household well can be drilled. I mentioned in my last newsletter that a recent study outlined the significant economic damage our state will face without permanently addressing Hirst. You can read more about that study and what our lead negotiators are doing by clicking here. Our negotiators have been working throughout the interim to find a solution. However, House Democrats have yet to deliver a proposal that their caucus can support. We have been willing to negotiate and provide concessions, but we cannot negotiate against ourselves. 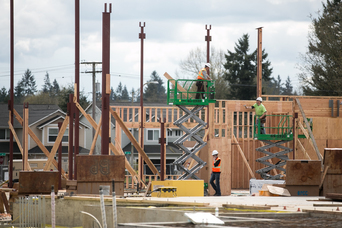 The Capital Budget has strong bipartisan support, but Seattle-centric lawmakers have failed to realize what their apathy toward rural residents of our state actually means. While large urban areas continue to grow, rural communities and property owners have been held hostage without access to water. That is unfair. We need people to realize that for many in our state hooking up to municipal water is not an option. Ironically, in some cases, urban areas are using the same watersheds and streams to fuel their growth that rural communities are now being told they cannot access. The Senate approved a bipartisan bill four times to address the flawed Hirst decision, but the House refused to vote on it. I believe that our emphasis is misdirected to borrow money to build government buildings while property owners are denied the ability to improve their land or build a home if they need a well. Late in October, the education-funding debate took another step as the state and plaintiffs in the McCleary case presented oral arguments before the state Supreme Court. While some special interests continue to claim that more money is needed for basic education, the attorney general, who is representing the state, believes that “the state is in compliance” with the court’s directive. 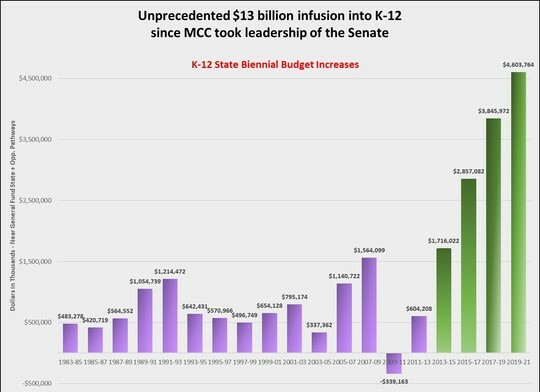 Under one-party control in Olympia, general government growth outpaced education spending; after we began leading the Senate in 2013, our Senate Majority Coalition (MCC) made education the state’s priority in our budgets. We’ve invested an unprecedented amount of money into our state’s K-12 system: over $4.5 billion over the past four years, and in all, $13 billion into K-12 education, doubling education spending since the landmark court case. We will have to wait and see how the court responds to this progress, but I am optimistic. 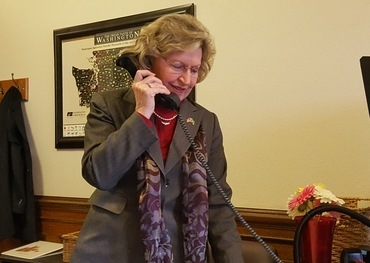 What gets lost in this conversation concerning McCleary is the state’s responsibility to fund basic education, a term clearly defined in state law, as opposed to a list of wants proposed by some special interests. You can watch the court proceedings by clicking here. Part of reforming education included making changes to our state’s tax system. You may notice advisory votes on this year’s ballot. By state law, those must be included and they are an opportunity for the Legislature to gain input from constituents on the changes we’ve made. For more information please click here to visit the Secretary of State’s website. I will keep you apprised of any developments from Olympia as they happen. Until then, please feel free to reach out to my office with any questions or concerns you may have about your state government, or if you’d like to schedule a meeting or for me to attend a community event. Remember to vote this Nov. 7!